My maternal grandfather, who was a prominent pediatrician and radiologist, used to say that “Judaism is the Cadillac of religions.” Although my grandfather’s formal Torah education pretty much ended at his bar mitzvah, he had a deep appreciation for the brilliance and profundity of Torah study – something to which he returned much later in life, after retirement. Even those who are not members of the tribe, and those who are very delinquent members, are aware of the theological sophistication of Yahadus and its highly intricate and logical legal system. Jews were always known to be the most literate and wise people in their host societies; the God-given intellectual abilities of the Jew mirror the exceedingly advanced character of his religion. The measles outbreak in Rockland County (and Brooklyn, and other Orthodox areas) challenges this all. In defiance of proven medical knowledge and basic public safety, anti-vaxxers have helped engender one of the most pervasive measles outbreaks in recent history. Obviously, the chillul Hashem of Jews spreading disease and the health crisis of hundreds of new measles cases are bad enough, but those who refuse to vaccinate are portraying our people and Yahadus in turn as backwards, primitive and crude, akin to the type of ignorant and delusional people and ideologies that embrace and propound conspiracy theories and other homespun bubbe-mayses. Although Orthodox anti-vaxxers comprise a small fraction of the larger anti-vaccine movement, their actions are causing a major chillul Hashem and are endangering the entire community on many levels. These selfish people, conspicuously pictured wearing tzitzis, yarmulkes and sheitlech in articles around the globe, are tarnishing the noble image of traditional Judaism and Jews, and are of course arousing enmity, as they portray themselves to the world as devoid of seichel and refinement. Is this the image of Judaism and its people that Hashem seeks? My grandfather administered all of the recommended vaccines to my entire family, including me. As I interface with people from the measles-infested areas, I thank God that I was given this basic and most necessary protection. 1) hareidi anti-vaxxers may be a small percentage, but their concentration in a few areas makes for a larger risk and chillul HaShem. 2) hareidi anti-vaxxers share an affinity; other anti-vaxxers come from many diverse groups of kooks. 3) my largest concern is not for stupid anti-vaxxers; it is their effect on infants below the age of vaccination. Studies have shown conspiracy theory belief is correlated with a lack of education. Unfortunately this is just another way the chareidi community is reaping the rewards of not listening to chazal who emphasised the importance of secular education as well as Torah. This is incorrect as many anti-vaxxers are not Jewish and well educated. Some people see conspiracies everywhere. The same articles that are in the media today, discussing the williamsburg school responsible for multiple cases, also make note that the anti-vax percentage in our communities is comparable to other communities. Sure, we would love that they had followed the health department guidelines, but outbreaks are happening in multiple communities. I have a hard time labeling this a chillul hashem. Are we really responsible for the mass hysteria related to this topic? A Forbes article in 2015 notes the first death in a decade from measles in the US. Contrast that with 80,000 (!) deaths from the flu in 2017. Should’t we be more concerned about that? both in the media and both with expectations from the CDC? I find some hypocrisy here. Instead of mass disruptions for such a relative minor killer, shouldn’t we focus on the flu? Maybe require everyone in flu season to wear masks and gloves. What about antibiotic resistance? It killed 23,000 last year, mostly linked to overuse of antibiotics. Fairly easy to avoid with less patients demanding it and less doctors over prescribing. Where is the uproar? Instead of mass hysteria maybe we need to step back a little and take a deep breath. Should’t we be more concerned about thatGood question, why the big hue and cry about measles vaccine and not about ensuring people do not become a much more likely danger to others in spreading influenza. Agreed-and don’t understand even blogs of Orthodox thought discussing measles vaccine in a vacuum. A serious halachik and hashkafik issue is the responsibility to be vaccinated for flu and measles among other diseases not only to protect oneself but also to prevent being a mazik against others. 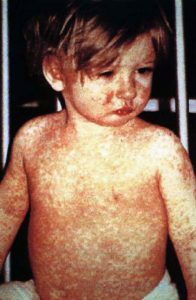 From 1958 to 1962, the U.S. averaged 503,282 cases and 432 death associated with measles each year. 6 Before the first measles vaccine was licensed in the U.S. in 1963, measles increases were seen generally in late winter and spring 7 every two to three years. According to the CDC, flu-related deaths between the years of 1976 and 2007 ranged from 3,000 to 49,000. From 2010 to 2016, the flu-related death rate was between 12,000 and 56,000. Estimates for 2017-2018 are about 80,000 deaths from flu. Use -ic and not -ik if you’re writing in English. “They tend to be better educated. They tend to be white, and they tend to be higher income. They tend to have larger families and they tend to use complementary and alternative medicine like chiropractors and naturopaths,” Salmon said. As your accusation is incorrect, I would like to know the basis of your second assertion, that chazal want us to get a secular education. do you seriously not know sources where Hazal demand a secular education? 1) the obligation to teach your son a trade translated to current times. 2) gemara’s assertion about the limited success of those who tried a torah-only approach. Neither of your points require a secular/college education. Certainly your second point invalidates your first. The comment in the gemarah was in reference to Rav Shimon bar Yochai who couldn’t tolerate anyone striving to earn any parnasah. The people he burned up were not doctors. SB, yes by me and a host of gedolai olam. my second point supports my first as any familiarity with commentary by talmudists or halakhists would make abundantly clear. and moving the goal posts is the sign of losing an argument. you added to secular – secular/college education. It does not require much effort to see that you are being deceitful. You took issue with my arguing the statement of chazal seemingly placing importance on secular education. You turned the conversation to one of parnasah. I would welcome proof to either statement. If it is as you say It would be a simple matter to provide me with a source in chazal or reshonim etc that supports a secular education, I am open to being wrong. I fully agree that trade school would fall under the command to “teach your son a parnasah” but I don’t believe that was the intent of the statement “secular education”. If the intent of the statement was college then I fully disagree that chazal would support it. As all evidence points in the opposite direction. We know that chazal made numerous gezairos to keep us from mixing too much with the goyim. We see the wisdom in the gezeiros of chazal. I still remember on this site two years ago an article published by R’ Dov Fisher which mentioned the 80% attrition rate of kippah wearers in his starting class. We read everyday in tefilah the words of chazal that state that parnasah is a matter of biatchon. We see the burgeoning economies of areas such as williamsburg. If you walk the streets of Willy these days the latest fashion is yellow hard hats and curly payos. I see in my own family, I am the only male to go to college yet everyone is making a parnasah and some are living a very nice lifestyle. To better understand the relation of secular education and parnassah, I suggest you read the two teshuvot of Rav Dovid Friedman (karliner) ztl on secular education. They are dramatically different; I believe Prof. Leiman has a lecture explaining the reasons for the difference from his perspective. That will provide you with perspective with which to discuss the subject. This area generates more puffery than reasoned discussion. The former is easy; the latter requires familiarity with practice given history, circumstance, etc. and discussion has not proven to be useful on a blog. as far as statistics about religious attrition rates in secular colleges and other institutions, i choose to trust professionals in the field. other oft-quoted “statistics” by amateurs based on their extensive observations have not proven to be reliable. “Apparently the police had suspicions that the baby’s parents had not followed a doctor’s standard prescription of antibiotics to treat an infection, and had instead relied on an unlicensed alternative healer to cure her. Shulchan Aruch requires us to eat on Yom Kippur, an Issur Kareis! If instructed to by a qualified medical doctor. If you don’t trust Doctors, try putting orange juice in your cars gas tank as an alternative to fossil fuels. Interestingly enough, the rates of non compliance (or partial compliance with vaccination protocols) seems to be roughly equivalent between the general population and the medical field. Research shows that about 6% of MD’s don’t follow the protocol. The idea of “the more preposterous the better” comes from another religion, not ours.